The Permanent Account Number (PAN) is a very important source of information for both citizens and the government. It is a ten-digit unique alphanumeric number issued by the Income Tax Department, generally in the form of a laminated plastic card, commonly known as PAN card. PAN is used for a host of services like applying for license, opening a bank account, for investments (like deposits, mutual funds), applying for loans, buying a house or car, applying for passport and many more. Hence, it is very important to note that, the PAN you carry is accurate and error-free. Mistakes in a PAN card can be anything from your name, date of birth, surname, etc. And, if these informations are not correct, then your further practices like paying tax, bank account, filing for Income Tax Return (ITR) or even earnings will be impacted. An error in PAN can be rectified through your birth certificate, as the card must hold the name as it is in your certificate. Currently, every citizen who has obtained Aadhaar card is mandatory to quote the 12-digit biometric number in their PAN application. Simply put, Aadhaar is compulsory for linking with PAN or applying for a new one. With this, it is very important that details in both Aadhaar and PAN match, otherwise your ITR filing will be hampered. ITR allows you to reduce your taxes you pay on income and income from other sources, by letting you claim some amounts on them. Hence, here’s how you can correct mistake in PAN. Firstly, you must request for change or correction in PAN data. This can be done by filling a form given by IT-department. This is how it looks like! 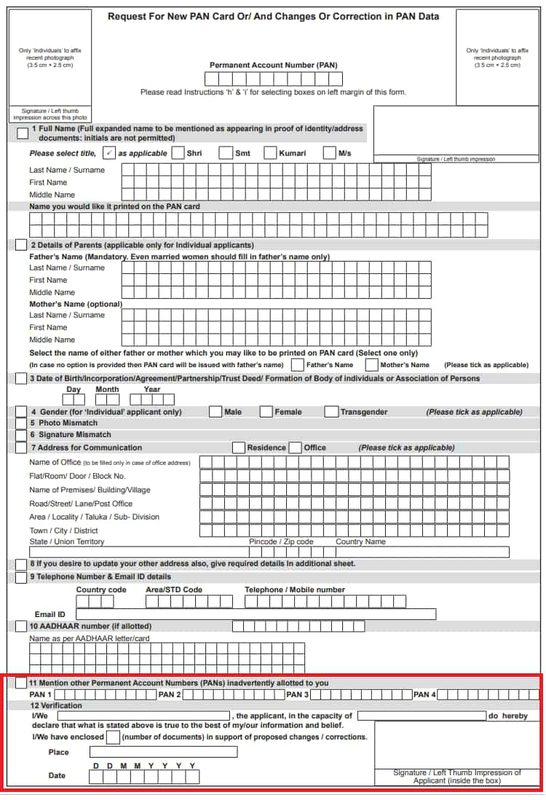 For changes or correction in PAN data, fill all mandatory fields of the Form and select the corresponding box on left margin of appropriate field where correction is required. If the application is for re-issuance without any changes in PAN data, then fill all fields in the Form but do not select any box on left margin. In case of either a request for Change or Correction in PAN or request for re-issuance of a PAN Card without any changes in PAN data, then address for communication will be updated in the ITD database using address for communication provided in the application. Make note, a person cannot hold more than one PAN card. If anyone has practice this method then a fine of Rs 10,000/- is liable to be imposed under section 272B of the Income-tax Act, 1961 for having more than one PAN. PREVIOUS POST Previous post: GPS trackers, emergency buttons in public service vehicles soon!